Freedom of the Seas in Oslo, 2006. Propulsion: 3 × ABB Azipod podded electric propulsion units, two of them azimuthing, one fixed. 4 additional bow thrusters. The Freedom class is a group of three cruise ships for Royal Caribbean International. 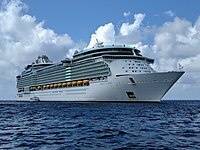 The first ship of the class, Freedom of the Seas, was the largest passenger ship in the world, and the largest ever built in terms of passenger capacity and gross tonnage, when it was built in 2006. These two records were then shared by all three ships until the construction of the Oasis of the Seas was completed in November 2009. Freedom of the Seas left Aker Finnyards Turku Shipyard, Finland on 24 April 2006 and started regular sailings out of Miami the next month. The second ship of the class, Liberty of the Seas, sailed on its maiden voyage on 19 May 2007. The third ship of the class, Independence of the Seas, was delivered and started work out of Southampton in April 2008. A Freedom-class ship compared with other large structures. The Freedom-class ships are similar in design and layout to the earlier second-generation Voyager class, including an ice skating rink and a 400-foot (120 m) mall named the Royal Promenade, featuring pubs, shops, arcades, bars, and a 24-hour Cafe Promenade. New features added to the Freedom class include the FlowRider surf park, cantilevered whirlpools, a full-size boxing ring, and the H2O Zone waterpark. In March 2008, Aker Yards and Royal Caribbean announced a memorandum of agreement for a fourth ship in the class, subject to board approval and finalization of terms and conditions, but no actual order for the ship was ever announced. In 2011, Royal Caribbean announced that it had ordered two ships from the similarly-sized Quantum class, making an order for a fourth Freedom-class ship unlikely. Freedom of the Seas 2006 4 June 2006 154,407 Largest cruise ship in the world, 2006–2009. Refurbished January 2015. Liberty of the Seas 2007 19 May 2007 155,889 Originally named Endeavor of the Seas before construction started. Independence of the Seas 2008 2 May 2008 154,407 Refurbished April 2013 and April 2018. ^ "Possible Fourth Freedom Vessel To Be Built By Aker Yards". Aker Yards press release. 3 March 2008. Retrieved 3 March 2008. ^ a b "2016-2017 Royal Caribbean Fleet Guide" (PDF). Royal Caribbean International. 26 February 2016. Retrieved 4 March 2016. ^ "Liberty of the Seas (26180)". DNV GL Vessel Register. Det Norske Veritas. Retrieved 13 May 2007. ^ "Endeavor of the Seas Trademark Information". Trademarkia. Retrieved 22 April 2018. This page was last edited on 30 December 2018, at 09:04 (UTC).